SC 1548, Babelon 520, CSE 1213-1214, LeRider Suse p. 330, B20, pl. lxiv, 7-8. 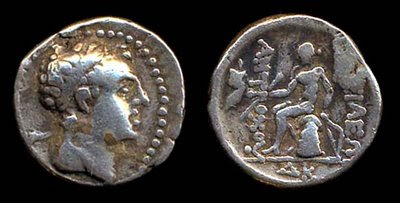 O: diademed hd of Antiochus IV r., with older features, thin diadem ends waving in parallel behind, dotted border. R: [BAΣ]ΙΛΕΩ[Σ] on r., ANTIOXOY on l., Apollo std l., on omphalos, testing arrow and resting hand on grounded bow. Die defect over BAΣ.